Charles Henry Dunn, the son of a carrier, John Dunn and Catherine Elliott, was born 1890 at Rosemeath, near Bombala, NSW (7311/1890). Aged 24 years and 8 months, he enlisted in the Australian Imperial Force (AIF) on October 19, 1916 at Goulburn, NSW. The enlistment papers record he was just 5 feet 3.5 inches tall, weighed 122lbs and had a chest measurement of 31-34 inches. They also record he had a dark complexion, grey eyes, brown hair and a scar on the right side of his jaw. After enlistment at Goulburn, he was transferred to the 55th Battalion and then to the 12/30th Battalion at Liverpool, Sydney. He left Sydney on November 25, 1916 on the the “Beltana”, a troop vessell which took him to Plymouth England. After arrival in England, he was with the 8th Battalion, and was given some basic training. After a short period of time in hospital, on May 3, 1917 he left Folkstone, Kent for service in France. As a member of the Fifth Division he was marched out for service in Etaples on the coast of France a few days later. On October 12, 1917, he was shot in the left leg and spent much of the next few months in the field hospital in Buchez, France. He then returned to his battalion and on December 12, 1917 was transferred to the 15th Australian Field Artillery. His record for 1918 contains little detail, except that between January 29, 1919 and February 28, 1919, Charles was seriously ill in hospital with influenza. He left Le Havre, France on May 12, 1919 and arrived at Weymouth, England the following day. He disembarked on May 7, 1919 and on the voyage back to Australia, became sick with Celulitis, a diffuse suppurative bacterial inflammation of the subcutaneous tissue. Pte Charles Dunn, son of Mr John Dunn, returned home this week after doing duty with the A.I.F. on the battlefields of Europe. Both Halls were utilised for dancing and suppers, and they were both taxed to the utomost to provide dancing room and supper accommodation for the great crowd. To give an idea of the number of people assembled, it is estimated that 700 people were fed at the two Halls, and still there was food over. Nothing bigger than this has ever been known in Bombala. When local diggers…arrived home they soon found that they had come home to no bed of roses, the economic situation wasn’t good, and the returning heroes found what jobs were available were already filled, and the Government re-establishment promises were mostly promises, so the bulk of them were unemployed. A fund called the Provisional Trustees Returned Soldiers Fund had been formed to help returned soldiers get re-established. The fund wasn’t enough, so it was soon decided that each riding of the Shire and the Bombala Municipality would provide work and each man would have to work for what he got out of the fund. However The 50-pound grant given to soldiers who had resided in Australia for 14-years prior to the outbreak of the War ceased on October 31, 1921 In 1921. At the age of twenty eight, and working as a labourer in Bombala, Charles married Bertha Ellen Rixon, an eighteen year old woman born at Pambula, currently in domestic duties at Bombala.Their marriage on January 19, 1921 (1921/002992) at St Matthias’ Church of England, Bombala took place with the permission of her mother, Ellen Rixon. They were married by D.D. Curthous in the presence of Ellen Rixon and J.P. Dunn. 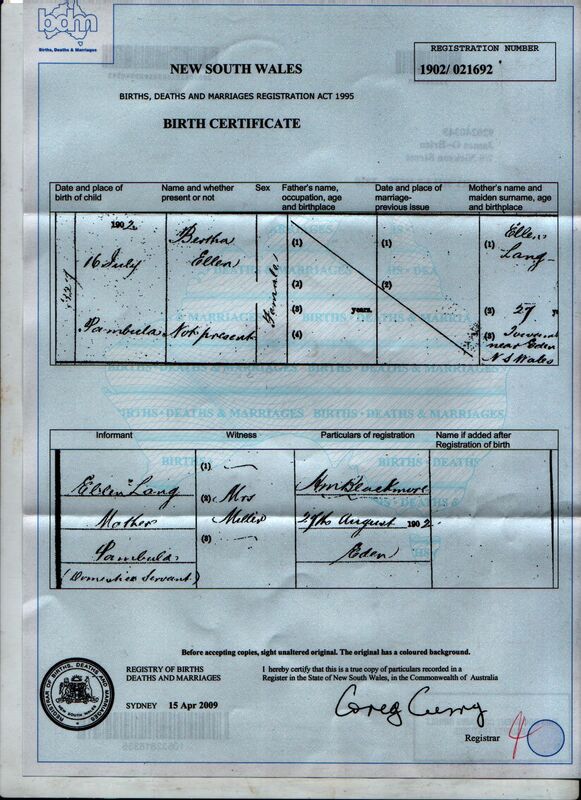 As her parents were first cousins William Rixon and Ellen Laing, her father was not named on the birth certificate. She was born at Pambula on July 16, 1902 (21692/1902). Interestingly enough, Ellen was 27 years of age at the time which was possibly quite old not to have been married in that era. According to the Birth Certificate, Ellen was a Domestic Servant at the time of the birth, and the witness to the birth was a Mrs Miller. I wonder who Mrs Miller was? At this stage, I know almost nothing about the early years of granny’s life, except that her father, William Rixon married and started another family when she was very young. I presume that she grew up with her mother (and possibly her grandparents) in the Pambula/Towamba district, and that by her late teens, she was probably living in the Bombala District. This requires further research. The first child of Charles and Bertha, Bertha Ann, arrived on February 7, 1922. After their marriage, Charles obtained worked as a linesman for the PMG. His work took him to a number of locations in NSW, including Orange, although to date I have been unable to confirm the locations in which he worked based on electoral roll data. I can confirm, however, they had left Bombala by 1925.By the mid-30s with a young family in tow, they moved to Lismore on the NSW North Coast. Over the next few years, they also lived at 8 Baillie Street (now an empty paddock) and in Ballina Street , before moving to 13 Union Street (probably about 1941). blood. The motor car, which was driven by Charles Henry Dunn, of High street and contained Mrs. Dunn and three children, was being driven into Lismore from Byron Bay. Maher, who lives in Coleman’s-street, was travelling towards the Ballina Cutting. when picked up was suffering from extensive, lacerations on the arm. One cut extended the full length of his forearm. He was treated by the Lismore District Ambulance, and taken to a doctor’s surgery where the wound was stitched. The passengers in the motor car escaped injury. The off side head lamp on the car was broken, and the steering was rendered ineffective. One mudguard was dented. The headlamp bracket, and the exhaust pipe on the motor cycle were smashed. Pleading guilty at the Lismore Police Court to having been drunk in Molesworth-street on Saturday night, Henry Snook (72) was fined 5s, with the alternative of three hours’ hard labour. Patrick James Daley (52), who was charged with being drunk in Molesworth-street on Saturday after noon, and Charles Henry Dunn (50), charged with drunkenness in Union street, South Lismore, on the same day, failed to appear, and forfeited their recognisances of 10s each. When I saw this confirmed report, I couldn’t help but wonder if an earlier report in the Sydney Evening News of July 27, 1908 was also linked. In terms of timing, it sounds right. AT THE CENTRAL POLICE COURT. Mr. Donaldson, S.M., was busy for over an hour this morning at the Centra! Court dealing with persons who had allowed excitement to get the better of th-»ir d’ecr«don during the strike scenes. The evidence was mostly of the same type. The offenders had been boo-hooing, hooting, pushing the police, or using ‘language.’ Mr. Donaldson said if the men came along as;ain for such charges he would deal wita them very severely. Frederick Clements, 60, a compositor, was charged with drunkenness ajd disorderly con duct in George-street, on Sat irday.. The ar resting constable said that Clements was abusing the conductor of a tram, And caused a crowd to collect. He was fin?l 20s, or 14 days’ imprisonment. Joseph Thomas, 31, wireworker, charged with being drunk and disorderly in Regentstreet, city, on Saturday night, was calling the police, who were arresting some riotous persons, mongrels, scabs, and blacklegs. A crowd of five, or six hundred persons gathered round the entrance to the police station. He was fined 20s, or 14 days* gaol. Each of the followingwas fined 20s, or 14 days. for riotous behaviour in George-street: Charles Henry Dunn, 17, drover ; Henry Mercer, 20. blacksmith; Daniel O’Connell, 3S, laborer; George Purcell, 28, laborer; Albert Dunn, 19, laborer; Robert Dunn, 18, mechanist; George \Vilson, 22, laborer; William Johnson, 22, laborer; John Quill, 17, paper boy; Frank Cann, 20, showman; James Symington, 18, laborer. Charles Dunn died at Lismore Base Hospital on Saturday, July 24, 1943 due to heart and lung disease. A funeral announcement appeared in “The Northern Star” on Monday, July 26, 1943. DUNN – The FUNERAL of Mr Charles Henry Dunn, of 13 Union Street, south Lismore, will move from Our Lady Help of Christians Roman Catholic Church, South Lismore, TO-DAY (MONDAY) following a service commencing at 4pm for the Roman Catholic portion of the Lismore cemetery. WILL. RILEY & SON, Funeral DirectorsR.S.S.A.I.L.A. LISMORE SUB-BRANCH – The members of the above sub-branch, all all returned soldiers, are requested to the attend the FUNERAL of their late comrade, Charles Henry Dunn, to move from the Roman Catholic Church, South Lismore, TO-DAY after a service commencing at 4pm for the Lismore cemetery. H.C. NOTT, Secretary. Mr. Charles Henry Dunn (53), a returned soldier of the 1914-18 war, and a resident of 13 Union street. South Lismore, died in the Lismore Base Hospital on Saturday night after a long illness. Mr. Dunn, who had resided in Lismore for only a few years, had not enjoyed good health for the past 10 years. He was a senior linesman attached to the P.M.G. department for 17 years, but was compelled to resign in 1936 owing to ill-health. The deceased was born at Bombala and was in war service for four years. A widow and six children survive. The sons are Arthur (A.I.F. ), and John (South Lismore >, and the daughters, Betty. Eunice, Joan and Edna, all of South Lismore. The funeral will leave the Roman Catholic Church at South Lismore to-day, after a service commencing at 4 p.m.. for the Lismore cemetery. Returned soldiers are requested by the Lismore R.S.S.A.I.L.A. to attend the funeral. An obituary appeared in “The Northern Star” the following day. MR C.H. DUNN Mr Charles Henry Dunn, a returned soldier, of 13 Union street, South Lismore who died in Lismore on Saturday night, was buried yesterday afternoon in the roman Catholic portion of the Lismore cemetery. The remains were conveyed to our Lady Help of Christians Roman Catholic Church at South Lismore, where a service was conducted by the Rev. Father Daniel McGrath, who also officiated at the graveside. The casket was draped with the Union Jack and at the conclusion of the graveside service Mr. Elwyn Roberts sounded the “Last Post”. The pall bearers were Lieut H.C. Nott (Secretary), and Messrs R. Stoker (Returned Soldiers’ League), W. Rutley, J. O’Brien, L. Winkler and E. Eggins. The wreaths were carried by Messrs T. G. Lovett (RSS and AILA) and TD Cleary. Messrs Will Riley and Son conducted the funeral arerangements. Anecdotal family history records that Bertha worked as a cook for a number of years at Lismore’s “Mecca Cafe”, though I am unsure if this was before or after the death of Charles. I do recall, however, from my own childhood that on the odd occasion that granny cooked a meal, they were quite good. Her jam tarts, in particular, were memorable.Bertha continued to live at 13 Union Street South Lismore until about 1959. Her children, Arthur (and wife Frances), Joan, Edna and Leslie John also lived in the house for varying periods of time.Then in about 1959, she and her son, Leslie John moved into 21 Kyogle Street, Lismore with her daughter, Bertha and son-in-law. A very vague childhood reference I recall was that granny had some sort of “breakdown”. Throughout the 1950s and 1960s, the children of Charles and Bertha married and raised families of their own. Most remained in the Lismore district, including at Casino and Alphadale Crossroads, while one daughter, Edna, moved to Brisbane. Family photographs record a visit to Sydney in the 1960s (probably about 1968), possibly related to the move to Hong Kong by her grand-daughter and son. Family history records a visit by Bertha to her sister Ruby (known as Molly). Bertha Rixon died January 16 and was buried at the Lawn Cemetery, Goonellabah on January 19, 1987. The funeral notice appeared in “The Northern Star”. * Bertha Ann Dunn was born at Bombala on February 7, 1922. She married Albert Bernard O’Brien in Lismore. They met, married and raised a family of four daughters and one son. For more information, click on the link. * Charles Arthur Dunn (known as Arthur) was born at Bombala in 1923. The Northern Star of Friday March 6, 1936 record’s Arthur’s first problem with vehicles. Others followed later in life. Bicycle Out of Control – After narrowly missing a hidden fencing post, Arthur Dunn (12), of High-street, struck the ground heavily with his head when a bicycle he was riding down a hill in Spring street, East Lismore, yesterday after noon got out of control. The lad, who was delivering milk for Mr. P. Ritchie, was treated by the ambulance officers for concussion and later admitted to the Base Hospital for observation. The boy was riding towards the intersection of Spring-street and Second Avenue when the cable attached to the brake on his bicycle snapped. The cycle gathered speed and the boy lost his seat when the machine struck a gutter in Second Avenue. Mr. and Mrs. C. Dunn, of 13 Union-street, South Lismore, have received a telegram from their son, Arthur, stating – that he has arrived in Australia from New Guinea, and is well. He married Francis Ina Smith at Lismore in 1946 (4400/1946) and they had several children together. DUNN-SMITH.- The marriage of Frances Ina, daughter of Mr. and Mrs. G. L. Smith, of Lismore, to Charles Arthur, son of Mrs. Dunn and the late Mr. Dunn, of South Lismore, was solemnised in the Holy Family church, North Lismore. The bride, who was given away by her father, wore a gown of white brocaded satin featuring a fitted bodice and long tight sleeves, with a softly gathered skirt. Her veil and coronet of orange blossoms was lent by her sister. She earned a bouquet of frangipani, baby roses and maiden hair fern. The bridesmaid was Miss Marge Workman. She wore a pale blue frock trimmed with pink ribbon bows, with a waist length veil of blue net falling from a coronet of frangipani and pink asters. Her bouquet was of pink roses and asters. The bride groom was attended by Mr. Tim O’Leary. The reception was held at the bride’s home, where the guests were received by the bride’s mother, who wore a frock of black georgette with a shoulder spray of pink and cream carnations. The groom’s mother wore a frock of black satin tiacked crepe with a tiger lily for a shoulder spray. The bride’s travelling frock was a blue flowered linen with white accessories. Mr. and Mrs. Dunn will reside at Millaa Millaa, Nth. Queensland. BAIL FORFEITED – Three Grafton and South Grafton men forfeited bail of £5 each when they did not appear before Mr. K. Anderson. S.M., in Lismore Court of Petty Sessions on charges of offensive behaviour. They were: Oram Clarence Quinn. 21. labourer, of South Grafton: William James Gillett and Allan George Olive,both of Grafton. Charles Arthur Dunn. 29, labourer, of Union Street, South Lismore. John Speeding, 22, labourer, of Johnston Street, North Lismore, George Albert Nellem. 39, labourer, Tweed Heads, and Walter Johnson, 38, painter, Union Street, South Lismore, forfeited their recognisances for failing to appear on drunkenness charges. Clyde William Brown, of Grafton, appeared and pleaded guilty to a drunkenness charge. He was fined £1/10/-..
Indecent Behaviour! Charles Arthur Dunn, 30, coal trimmer, was fined £5, in default imprisonment for 10 days when he admitted to Mr.K. Anderson, S.M., in Lismore Court of petty Sessions that he behaved in an indecent manner in Keen Street, on May 23. Sergt. C.P. Condon prosecuted. BALLINA, Saturday. – At Ballina Court of Petty Sessions, Charles Arthur Dunn, Union Street, Lismore, pleaded guilty to a charge of driving a motor lorry, in River Street, Ballina, on July 3,1953, while under the influence of intoxicating liquor. In giving Dunn the benefit of Section 556A of the Crimes Act, Mr. K. Anderson, SM., found the charge proved and, without proceeding to conviction, gave Dunn the opportunity to enter into a bond of £40 and one surety of £40 to be of good behaviour for a period of twelve months. Sergt. G. E. Tarrant, who prosecuted, stated he had seen Dunn driving a motor vehicle. Dunn stopped the truck and backed into the kerb opposite the Australian Hotel. Sergt. Tarrant said he noticed Dunn’s eyes were slightly blood shot. he was unsteady on his feet and his breath smelt of in toxicating liquor. He was not greatly affected by the liquor! Dunn admitted that he had three drinks at Lismore and some more at Ballina about 7.30 p.m. Mr. R. Balzer appeared for Dunn. Charles Arthur Dunn, a 30- year-old labourer, of Union Street, South Lismore, was fined £15 in Lismore Court of Petty Sessions yesterday for driving a utility whilst under the influence of drink. Donald E. Connor, a 28-year- old labourer, owner of the utility but a non-driver, was fined £5 for aiding and abetting Dunn. Dunn was fined a further £2 for having a faulty headlight. Both men pleaded guilty to the charges. Sergt. H. L. Holm said that at 11.35 p.m. on March 14, he saw the utility being driven erratically along Magellan Street. He stopped it and saw that Dunn was slouching against -the door. He asked him to get out and noticed that he was unsteady. He smelled strongly of liquor and his speech was incoherent. Connor, who was in the back of the truck, said he owned the utility and admitted that he had allowed Dunn to drive. “We had a few drinks, but I didn’t think he was as bad as that,” said Connor. Sergt. Holm said that Connor was only slightly affected by drink. After Mr. R. Balzer (for Dunn) had said that Dunn had lost his house and possessions in the flood, Mr. J. R. Scarlett, S.M., allowed him three months, to pay the £15 and one month to pay the £2 fine. Mr. Balzer said that although Connor owned the truck, he could not drive and was always dependent on someone else driving for him. Notably, the accomplice was his brother in law, Don Connor, married to his sister, Joan, and the reference to having lost everything in the flood. For many years, Arthur worked on the tick gates at places including Tabulam. He died at Casino on August 15, 1987. The funeral notice appeared in The Northern Star. Francis died in 2013. CASINO SUB-BRANCH RSL OF A – Members of the above sub-branch are invited to attend the funeral of their late comrade, CHARLES ARTHUR DUNN, as per above family notice. G Brand, Secretary. Eunice Lorna Dunn (known as Noonie) was born in 1927. She married Leonard Arthur Adams at Casino in 1946 (18545/1946). She died at Lismore on September 27, 1978 (106555/1978). Len later remarried and then died on March 10, 1999, aged 76. A week later, the following return thanks messages appeared in “The Northern Star”. Mrs Bertha Dunn and Betty O’Brien wish to express their sncere THANKS to St Vincent’s Hospital and Rev Sheppard, also Doris and Ray Grace for their kindness in our sad loss. Mrs Bertha Dunn. * Joan Kathleen Dunn (known as Joanie) was born in about 1928. She married Donald Ewin Connor in 1954 (25507/1954). Don was born March 4, 1926 at Dorrigo, NSW. He was a Leading Aircraftman, number 151793, 84 Operational Base Unit, Royal Australian Air Force Military Service 6 Apr 1944-27 Feb 1946 WW2.Don died on July 12, 2007. Miss Joan Dunn, of 13 Union St., South Lismore, has announced her engagement to Donald Connor, of 26 Bounty Street Lismore. Joan is the second daughter of Mrs. C. H. Dunn, and Don is the youngest son of Mrs. M. Connor. Joan is wearing a one stone diamond ring with a yellow gold setting. MOUNTAINS HONEYMOON. Honeymooning in the Blue Mountains are Mr. and Mrs. Donald Ewen Connor, who were married recently in St. Paul’s Presbyterian Church, Lismore. The bride, formerly Miss Joan Kathleen Dunn, is the daughter of Mrs. B. E. Dunn, of South Lismore, and the ‘groom the son of Mrs. M. Connor, of Lismore. A gown of white embossed organdie was chosen by the bride. It featured a V-shaped neckline, fitted bodice and graceful skirt. Her three-quarter length tulle veil was gathered on to a pearl coronet. The bouquet consisted of frangipanni, cream roses and carnations. Bridemaid, Miss Noela Connor, was the only attendant. Mr. Les Carrall was best man. A reception following the ceremony was held at the home of Mrs. Saywell, McKenzie Street. * Edna Teresa Dunn was born in about 1930. She married Oswald Mannix John Ianna at Lismore in 1951 (21785/1951). Thanks to information on Monaro Pioneers He served in the military as a Private, number NX141290 (N436276), 2/14 AUSTRALIAN INFANTRY BATTALION, Australian Army from November 27, 1942 to June 28, 1946 in WW2. . Ossie died March 2012 at the Greenslopes Hospital, Brisbane and was buried at the Northern Rivers Memorial Park, South Gundurimba via Lismore. Attended by her sister as bridesmaid, Edna Dunn, youngest daughter of Mrs. B.E. Dunn and the late C. H. Dunn, of Union Street, will marry Ossie Ianna, son of Mr C. Ianna, of Nimbin today. The wedding will take place in St. Carthage’s Cathedral. Lismore. Bridesmaid will be Joan Dunn, and Pamelina Sladen will be flower girl. Mr. and Mrs. Oswald Ianna are touring the Barrier Reef; and North Queensland following their marriage at St. Carthage’s Cathedral last Saturday. Mrs. Ianna, formerly Miss Edna Teresa Dunn, daughter of, Mrs. E. E. Dunn, of Union Street, South Lismore, wore a magnolia satin gown with a lace yoke and panel. Her tulle veil was held in place by orange blossoms.Mr. Ianna is the son of Mr and Mrs. C. Ianna, of “Sunny Crest”, Nimbin. The bride’s sister, Miss Joan Kathleen Dunn, was the brides maid and Mr. Alan Walker, the groom’s uncle, gave the bride away. Rev. Father Smith officiated at the ceremony. The reception was held at the Commercial Hotel, Lismore. The couple will live in Lismore. * Lesley John Dunn (known as John) was born in 1935. Union Street, Lismore, Barry J. Hutley, of Crown Street, Robert L. Kelly, of Ballina Street, and Vincent R. McDonald, of Cathcart Street. Sergeant C. P. Condon prosecuted. He died at Lismore on January 25, 2006. Bertha Rixon was born in 1902, the eldest daughter of first cousins William Rixon and Ellen Laing. Mr Charles Henry Dunn, a returned soldier, of 13 Union street, South Lismore who died in Lismore on Saturday night, was buried yesterday afternoon in the roman Catholic portion of the Lismore cemetery. The remains were conveyed to our Lady Help of Christians Roman Catholic Church at South Lismore, where a service was conducted by the Rev. Father Daniel McGrath, who also officiated at the graveside. The casket was draped with the Union Jack and at the conclusion of the graveside service Mr. Elwyn Roberts sounded the “Last Post”. Five Generations – Margaret O’Brien, Bertha Dunn, Bertha Lang, Jacqueline Hall, Margaret Hyland – taken in 1982. Charles Henry Dunn (28 year old labourer at Bombala) married Bertha Ellen Rixon (18 year old, born at Pambula, in domestic duties at Bombala) on January 19, 1921 (1921/002992) at St Matthew’s Church of England, Bombala. As Bertha was only 18 years old, permission for the marriage was given by Ellen Rixon. They were married by D.D. Curthous in the presence of Ellen Rixon and J.P. Dunn. The Bombala Times of Friday September 5, 1919 reported… Pte Charles Dunn, son of Mr John Dunn, returned home this week after doing duty with the A.I.F. on the battlefields of Europe. BOMALA TIMES Friday September 26, 1919 Peace Celebrations Bombala’s peace celebrations, although belated, were none the less enthusiastic and through. An empty paddock where 8 Baillie Street, North Lismore used to be located. My grandmother was Madeleine Rixon married to Jack Smith. They hada a farm in the Lismore region and my family came from Lismaore. I remember my mum saying that Grannie Rixon came from Bega. Do you know if she is any relation to Bertha? Let me firstly apologise that it has taken me several weeks to reply. was was located, maybe I can help you there? Enlisted RAAF WWII 6th April 1944 at Brisbane Qld. Service No: 151793. Rank: Leading Aircraftman. Unit: 84 Operational Base Unit. Next of kin: Margaret Connor. I have been searching for info on my grandfather Arthur John DUNN born about 1880 Hillston NSW, his father was John DUNN. Does anyone know if his is related.